Miami Palmetto Senior High School is one of the last 1950s Eisenhower-era schools in Miami-Dade County in its original form. 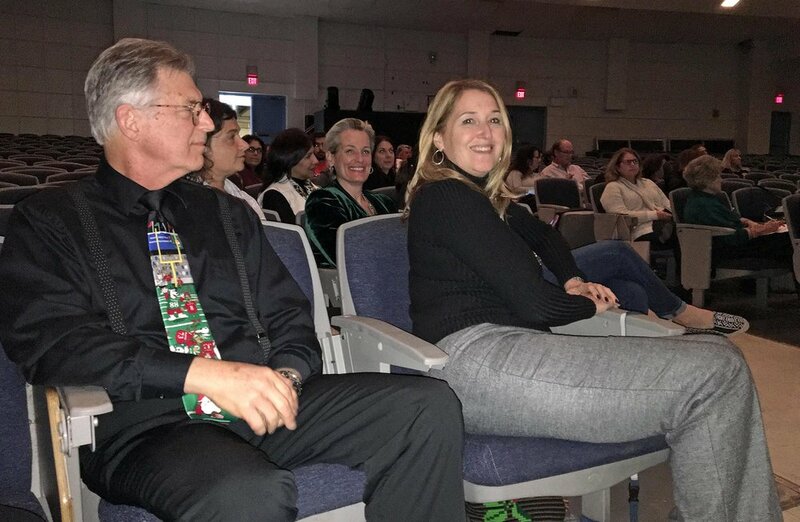 So, it was with pride and hope on December 11, 2017, that current principal Victoria Dobbs hosted a presentation of the significant renovation plans about to begin. About 60 interested parents, students and neighbors watched a presentation laying out the construction plan. The centerpieces of which is a three-story building that will house the administration and vocational labs. 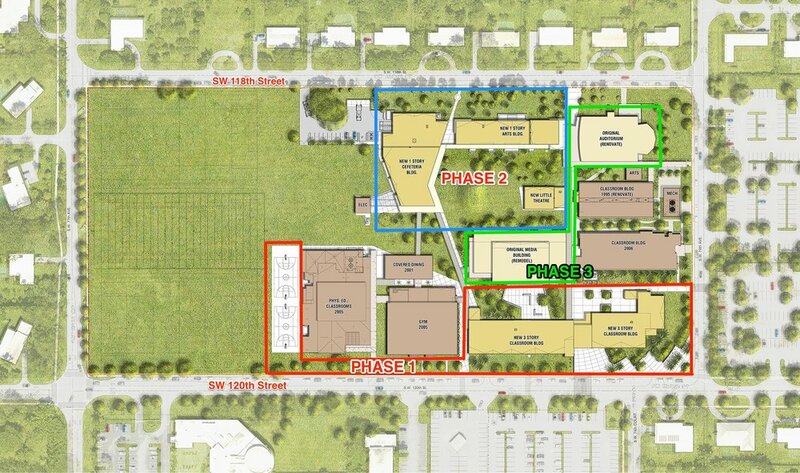 It also will shift the front of the school to SW 120th Street, which they believe will relieve traffic on SW 118th Street. The $44M bond that is funding the project will also add a new state-of-the-art cafeteria (to replace what has been called the worst cafeteria in all of Dade County, a single-story arts building and a black box theater. Beyond that, many of the existing buildings will be renovated and the whole school will get new paint and furniture. Phase one starts this spring. The existing faculty parking and basketball courts will give way to the start of the new 3-story building on the southeast part of the 18-acre campus and two new basketball courts will be added adjacent to the current sports field. The idea is that school life will continue normally throughout construction with minimal impact on students. Phase three is updating the existing buildings and putting in new furniture and fixtures. Completion is slated for 2021. In the end, the 120,900 square-feet of new construction will add capacity for only 90 more students, but the number of classrooms goes up and the educational environment is significantly improved. Attendees of the presentation were mostly pleased with the plan, but they did ask a few good questions. Palmetto Bay Mayor Eugene Flinn asked about green features and whether bike lanes and parking was considered. The response was tepid. While they won’t apply for LEED certification, they did ‘have green features in mind’ for the construction, such as efficient HVAC systems, LED lighting and low-flow plumbing throughout. However, no solar power is in the plan, which seemed odd to many in the audience. Drew Latta, a Palmetto senior and member of student council had the opinion that, “although the new building looks great, the density could be a negative to student life. Being that consolidated means less student freedom, walking and less activity.” He was also concerned about the safety of students during construction, in particular about airborne particles but felt that the order of construction mostly alleviated that concern. Several students, parents and residents were concerned about the parking and traffic flows around the schools. One parent called the existing parking lot ‘horrendous’ and many agreed. While the final parking situation will reduce the number of spots by nearly 100 (to 723 spots), the distribution of spaces will likely increase safety and reduce drive times. As for traffic flow, many were very concerned about pick-up and drop-off; however, no one seemed to have a real answer for those concerns and officials noted this may need to be addressed as construction proceeds. The audience asked about safety features as well. The new campus will include a large number of security cameras and one-way panic doors to thwart unauthorized trespassing. Valerie Volpe lives nearby on 118th Street, west of 77th Avenue, and went to school at Palmetto in its early years. She was sad that the iconic 50’s look of the entrance was going to be lost.